Soaring with Signals at Camden Fairview High! Students in Mrs. Vaughan's Biology class at Camden Fairview High School in southwest Arkansas are soaring high with Signals of Spring this season. Golden Eagles, Sandhill Cranes, Red-tailed Hawks, Bald Eagles, and Common Dolphins, are among the species students chose to investigate. Mrs. Vaughan is thrilled to be part of the Signals of Spring program, "As a teacher, it has always been my goal to expand my students' minds beyond the four walls of a classroom. Participation in the program has allowed the world to become my students' classroom as they develop hypotheses about migration patterns using real time weather, vegetation, and geographic data." In addition, Mrs. Vaughan notes that Signals of Spring encompasses many of the Biology standards required in Arkansas. Signals of Spring makes Mrs. Vaughan's students feel like 'real scientists'. "I get to study about an actual animal, and I have my OWN scientific journal!" exclaims one student. "I have learned to read satellite images and apply satellite data to other things." 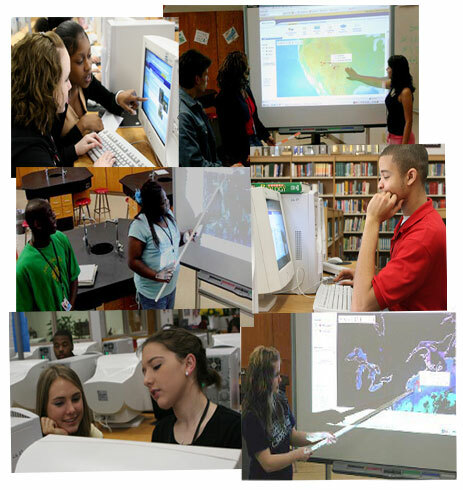 Using satellite data is a new experience for most of these 10th grade students. "It is remarkable for students to see this [data]," Mrs. Vaughan explains. "They have never done anything like this." Journal entries encourage students to think about the connections between animal movement and different biological and physical factors that affect animal behavior. Mrs. Vaughan's students put thought into their journals, knowing that a scientist will read them. One student explained, "I really like that my own scientific journal can be visited by a real scientist." When students work together, write journals, and share their insights, they develop important teamwork skills. "Signals of Spring has not only empowered our students with the ability to use technology to apply science concepts, but it has fostered collaboration skills as students learn to draw on each other's strengths and to appreciate individual contributions," explains Mrs. Vaughan. The interactive maps are particularly exciting for students, as one student describes, "I liked looking at the different types of maps because they were very fascinating to me. The color and information was very useful when it comes to research. I have learned that there are many considerations when it comes down to animals and their habitat. By using satellite data, I have learned that you get a better view on some things. Satellite data is very useful when studying animals." Many Signals of Spring animals are moving great distances this time of year. It is exciting to see the progress that each animal makes in a given week. One of Mrs. Vaughan's students comments, "The thing I like best about Signals of Spring is the actual satellite chart that shows how far the animals traveled. It's cool to me because it gives a visual picture of the distance the animal has traveled." Her classmate agrees, "I learned that dolphins do not stay in one place. The can migrate to many places. I also learned how to use longitude and latitude." As a new teacher at Camden Fairview High School this year, Mrs. Vaughan comments, "It has been wonderful to work in a district that encourages and supports preparing students for a more scientifically and technologically complex world. My principal has been very impressed with the wonderful learning opportunity Signals of Spring has provided." Great work Camden Fairview students! Keep it up.